After being met by your private guide, your tour will commence with a two and half hour Fabcabs of Liverpool taxi tour of Beatle wonderland. There will be over 20 stops for photo opportunities visiting Penny Lane, Strawberry Field, Beatles homes, schools and birthplaces along with Eleanor Rigby’s gravestone. Next you’ll stop at The Hard Days Night Hotel for English Cream tea. You will then stop at the Hard Days Night Hotel Beatle Shop to select your official Beatles T-shirt (one per person at a value of £15 each). Then you will continue with a Beatle Village walking tour, visiting the famous Cavern Club and the area around Mathew Street for over 20 more photo opportunities in the footsteps of the Beatles. Then you will board the Liverpool City Explorer open top bus for a city circular tour with commentary. 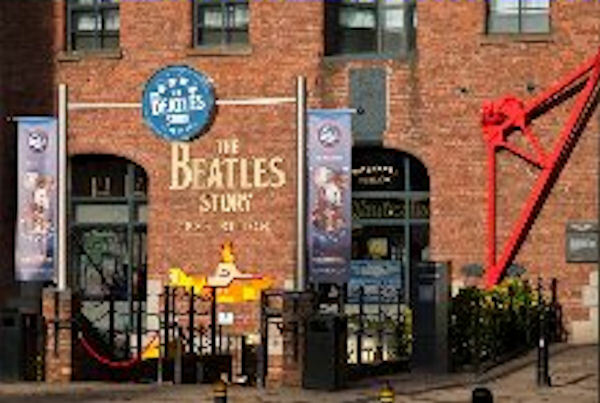 Your final stop of the day will be the Beatles Story Museum at Albert Dock. The award-winning Beatles Story experience is an atmospheric journey into the life, times, culture and music of the Beatles. Join us on a magical mystery tour to see how four young lads from Liverpool were propelled to the dizzy heights of worldwide fame and fortune to become the greatest band of all time. The guide can advise you of additional things to do in your free time you might have left during your stay in port.